I’m ending this article by mentioning a few more color managed applications that I find useful in my CG workflow. Feel free to chip in if you know of more useful color managed applications that I am not aware of that will make life easier in our line of work. I haven’t been able to locate a color managed media player and I don’t think such a player exists at this time. I do hope though, that a media player will get featured with display compensation based on the monitor profile to show correct colors on wide gamut screens, really soon. I could use that like… yesterday. I have for a long time used Directory Opus as my file manager and image viewer. DOpus isn’t color aware so on a wide gamut screen you will get oversaturated colors in it’s viewer. Adobe Bridge CS4 is color aware, but I don’t think it’s suitable as a quick image viewer. To my joy I noticed that XnView has become color aware. I hadn’t used XnView in a long time but after taking the latest version for a test spin it seemed sweet. Just the fact that it supports OpenEXR and Radiance HDR image formats was a huge plus. XnView is now my default image viewer, so I can see all my images colors correctly outside of Photoshop when I just want to open an image from the desktop, explorer or DOpus. It’s easy to setup XnView for a color managed workflow (See the attached screenshot). 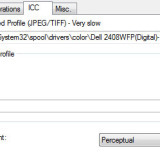 After checking ‘Use ICC Embedded Profile’ on the ICC tab I just direct XnView to the location of my Spyder 3 generated profile for my Dell 2408 display and it’s ready to go. 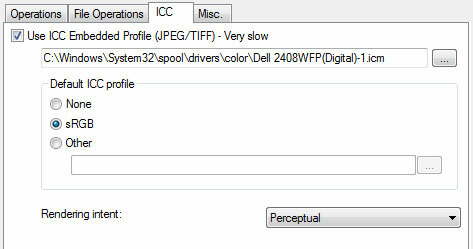 As an option I also checked sRGB as the default ICC Profile to be used when viewing an untagged image. Most untagged images I have are supposed to be in sRGB space so it lets me see them correctly as well. Worth noting is that the ‘very slow’ warning doesn’t seem to affect me, but I am on a fast system on the other hand. Another color managed image viewer is IrfanView. I haven’t had the time to check it out very thoroughly, but it seems nice as well with more or less the same options as XnView (Color Management, OpenEXR and HDR support). Actually even Window Vista’s built in Photo Gallery viewer is color aware and respect ICC profiles, so it’d work fine for basic needs, but I need an image viewer that supports a few more formats than Vista’s own. But I was a tad impressed that Microsoft had included a color aware image viewer in the OS. Safari on the Mac has respected ICC profiles for a while, I don’t know about the Windows version though (I don’t use Safari). But starting with Firefox 3.5, Firefox is color managed by default and respects ICC profiles. I am very happy that the Firefox developers have acknowledged the need for a color managed browser these days and all ICC tagged images looks correct in Firefox. Which reminds me that I should tag my portfolio images on this site so they look correct on most displays when visiting with a modern browser. So remember to always tag your images going to the web with the correct color profile to ensure that it looks the best. This can seem like a lot to take in at first, but it’s not that complex when you start getting into it, and after a while it becomes like second nature to have these things in mind. And even though we didn’t really care (at least me) about these things in the past when most monitors where somewhat similar, things haven’t gotten worse even if it feels like that at first. We have much more control now and learning how this works and taking advantage of the larger color spaces available today will work in your favor in the end. This is a new subject to grasp for many artists, and can be a bit tricky to get used to, but hang in there. I hope my mission was successful in trying to explain color management in a way that shouldn’t be to hard to understand and this will be an educational asset to help all of you out there interested in the color managed workflow – how it really works and what is happening. Keep in mind that I’m not an authoritative person in the color matter – I have tried to do my best to learn as much as possible though, so feel free to ask questions, comment, discuss or correct me if I have missed something to make this a great resource for people starting to get aware of the importance of color management and do it in a correct way. Great article! helped me alot! Big Thanks! Are there any color managed Media Player out there? I didn’t find any and as I know QuickTime and MS Media Player are not color managed!!! Also Adobe Premiere is not yet color managed! Do you know anything about color management improvments in Windows 7? I would realy like to know if Windows 7 could display color aware applications correctly. I think it should not be that hard to implement it because every untagged / color awre application could be tagged as sRGB and then should be displayed correctly. As I know Windows 7 has improvement in the rendering by supporting 16 – 48 bit per channel but I could not find informations about wide gamut support and correct displaying of color aware applications? Any information about that would be very helpful. As far as I know, no Media Player is yet color managed. I’ve seen some tricks to get Media Player Classic to be kind of color aware, but it seemed like to much hassle for me to endeavor. I’ll sit tight and I’m sure it will arrive a color managed player sooner or later. The biggest dilemma is that no video formats embed ICC profiles – but I guess the player could assume HDTV (rec 709) or SDTV profiles based on the video format and then use the display profile to give correct colors. I hope some solution like that will surface anyway. About Adobe Premiere, it has bothered me as well, that not even the slightest basic color management implementation is available. I find it kind of strange considering that Adobe has done a fine job in most of their other applications. I guess they might think one uses an accurate second external production monitor when color is important. But personally I haven’t used that in years and would find it natural that they color manage the viewer based on the sequence’s selected format. At the moment I do all my color gradings together with all other processing of my scenes in After Effects and bring them to the final visual state and just use Premiere for editing together the scenes afterward – and adding audio. I don’t touch the color controls in Premiere, until Adobe implement at least basic color management. I remember seeing that the latest version of Sony Vegas Pro, v9, had implemented color management, at least in the sense that you could assign your monitor profile for the preview window, so we’re definitely heading in the right direction for editors as well. Perhaps we will get there in Adobe Premiere CS5 as well? About color management in Windows 7, it’s getting better but still no cigar. Non color managed applications will still be over saturated in Windows 7. See my comment below for some more information I found regarding the color development in Windows 7 and coming versions. Nice work throughout……… your work is really inspirational…specially the late night Zbrush doodle…. >correct color profile to ensure that it looks the best. Just my two cents: about 75-80% of web surfers use IE7/8, which ignores embedded profiles. The only way to ensure that your web pictures look good is to follow web standards by uplading them converted to sRGB, tagged if you like. You’re completely correct. IE7/8 does indeed cause color problems if used on a wide gamut display. Also Opera 9.x (don’t know about the coming Opera 10) lacks color management. One can just hope that the intended target audience when publishing images online uses a color managed browser like Firefox or Safari if they are also using a wide gamut display. Btw, your image viewer looked interesting, especially as it’s available for 64-bit, I’ll for sure take a closer look at it. Media Player Classic – Home Cinema (MPC-HC) supports full colour management. I respect and am thankful for all your effort! I can imagine all the horror you had to go through! Great article, Johan. Should be required reading for any 3D artist trying to get a handle on this. Thanks!